I saw something very poignant and sad on the way to work this morning. Even on my short journey, the auto-rickshaw goes past quite a few rubbish dumps. They’re generally on a street corner, or a plot of empty land. Not really official dumps, but just a place used by the people who live and work in the area as a place to put their garbage. There are almost always rag pickers there too, sifting through the rubbish to find anything that has a value or that can be recycled. This morning I saw a young lad, around 7 years old, with the typical rag picker’s white sack over his shoulder. Even though it was only half full, it looked much too large for such a small boy. 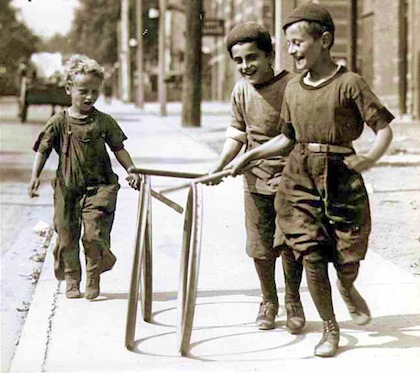 While carrying his sack, he was also playing with an old tyre and a stick, wheeling it along the road in the way that a child in a Victorian etching might be “trundling a hoop“. I see little street kids every day, and often they’re playing — tyres are very popular, and usually they’re chasing one down the road at high speed with a big grin on their face. Flying a small diamond-shaped paper kite is another favourite. I also see older kids working every day, whether they’re selling street food from a stall, helping their dhobi-wala father with the ironing, or even working on a construction site. 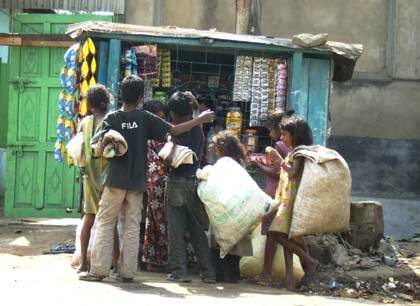 (Child labour is illegal in India, but still widespread.) And the ubiquitous poverty in India is something I’ve written about many times, and by now I should be getting used to seeing it every day. But there was something about seeing this little boy, playing happily enough but nevertheless scraping a living from piles of rubbish in the street, that was just absolutely heart-breaking. I spent the rest of the journey stupefied, with a huge lump in my throat.